This week, #SundaySupper is partnering with our friends at Gallo Family Vineyards to share our favorite Meals with Meaning. They say every recipe tells a story…just like every recipe is perfectly paired with a specific wine. Today’s recipes are being paired with Gallo’s easy-to-drink Merlot and Chardonnay wines. 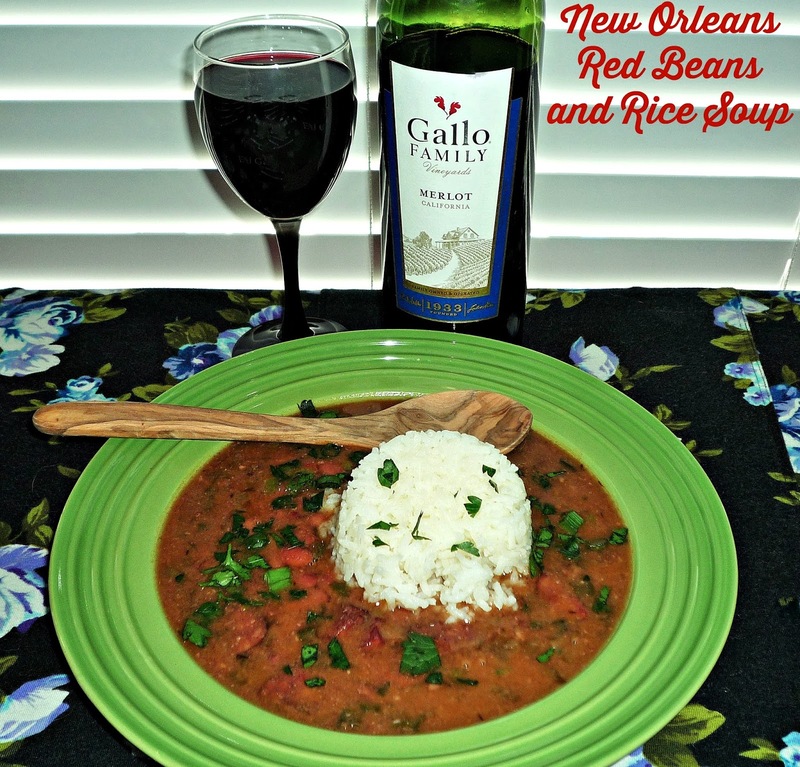 I’m sharing a recipe for spicy and smoky New Orleans Red Beans and Rice Soup, which pairs very nicely with Gallo's full-bodied Gallo Merlot. 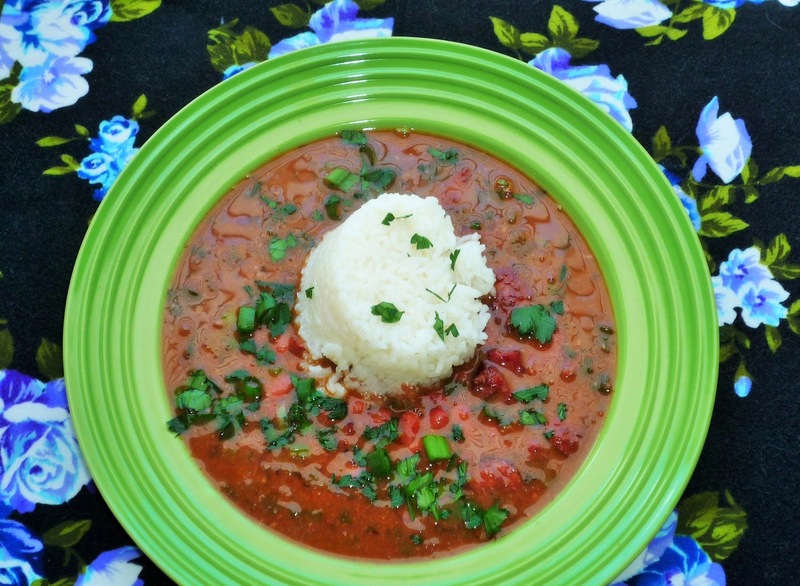 This soup is an updated spin on New Orleans’ traditional Monday meal of red beans and rice. This is my adaptation of a recipe I first tasted at Commander’s Palace the morning after Michael and I were engaged in 2001. That’s where this recipe’s story comes in! 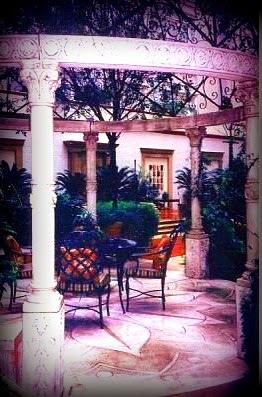 Michael had initially planned to propose to me during Jazz Brunch at New Orleans’ iconic Commander’s Palace. He had let the manager know ahead of time so they could help make the proposal extra-special. However, Michael decided somewhere between Houston and New Orleans that he was getting antsy having my engagement ring in his bag…so he decided to propose to me inside the historic St. Louis Cathedral in Jackson Square instead. When we arrived at the church, a wedding rehearsal was going on (irony! )…so his plan to “put a ring on it” was thwarted. Rather than wait until brunch the next morning, he was so eager to get that gorgeous Tiffany diamond on my finger that he proposed under a gorgeous gazebo in the courtyard of the Ritz Carlton that afternoon! Long story short…we end up at Commander’s Palace for an engagement celebration brunch the next day. Our server had been tipped off that an engagement was in the plans just before our dessert course…so he was a bit surprised to see me admiring my new diamond ring as it sparkled in the sunlight by our beautiful window table! Michael explained that he just couldn’t wait another day to propose…but the brunch was our official engagement celebration. Our server and the manager had a good laugh about this – and it was indeed an amazing celebration meal. On the menu that day was Red Bean Soup, which I had for my first course. I was so excited to find the recipe for this delicious soup in the Commander’s Kitchen cookbook. I’ve made a few tweaks to the original to suit our taste, including adding a scoop of rice to each bowl – similar to how gumbo is served. This soup is economical and tasty…and it also reminds me of our romantic engagement weekend in New Orleans! Step 1: Rinse the red beans thoroughly and set aside. Add the olive oil to a large Dutch oven over med-high heat. Heat the oil for 1-2 minutes. Add the onion, garlic, bell pepper, celery, and Cajun seasoning. Cook the veggies, stirring occasionally, until they are tender – about 10 minutes. Add the Andouille and ham and cook for 5 minutes. The meat will be browned, and the veggies will be golden-brown and very tender. Step 2: Add the red beans and 6 cups of the cold water. Stir to combine, then add the bay leaf and thyme sprigs. Bring to a boil and cook for 10 minutes – be sure to skim off any foam that collects on top. Cover, reduce heat to medium, and simmer for 1 hour. Give the soup a stir every 15 minutes or so to keep it from sticking. thyme sprigs from the pot. Puree half of the soup in a blender or food processor. Return the pureed soup back to the pot. Add the remaining 2 cups of water, the hot sauce, and Worcestershire sauce. Stir until the puree and water are completely combined into the mixture in the pot. Boil for 5 minutes, then reduce heat to med-low. Cook the soup, uncovered, for 1 hour longer. Stir occasionally, until the desired consistency is reached. Step 4: Add the chopped parsley, green onions, and salt & pepper to taste. 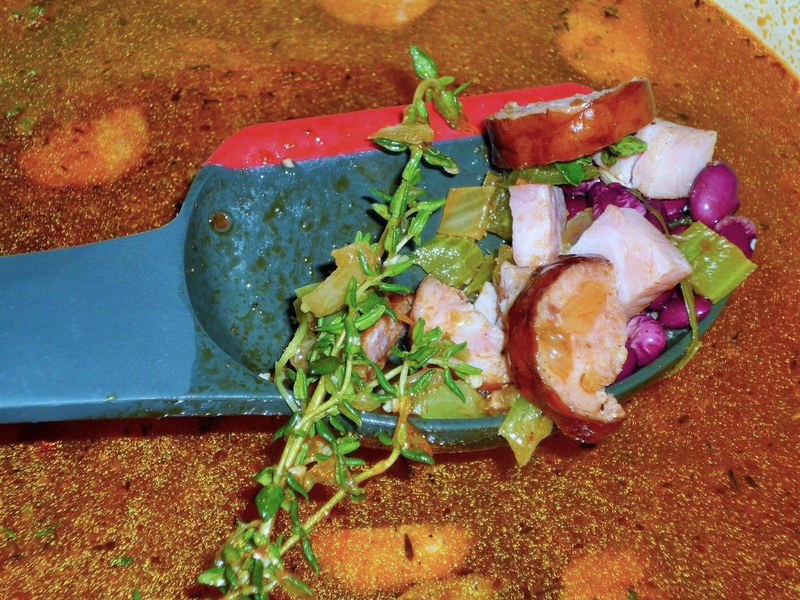 To serve, ladle the soup into shallow serving bowls. Add a ½-cup scoop of white rice in the middle of the bowl, and sprinkle with more chopped green onions and parsley. This simple soup is made with inexpensive ingredients, and it’s full of smoky flavor thanks to the double shot of sausage and ham! It’s hearty, but not overly heavy. 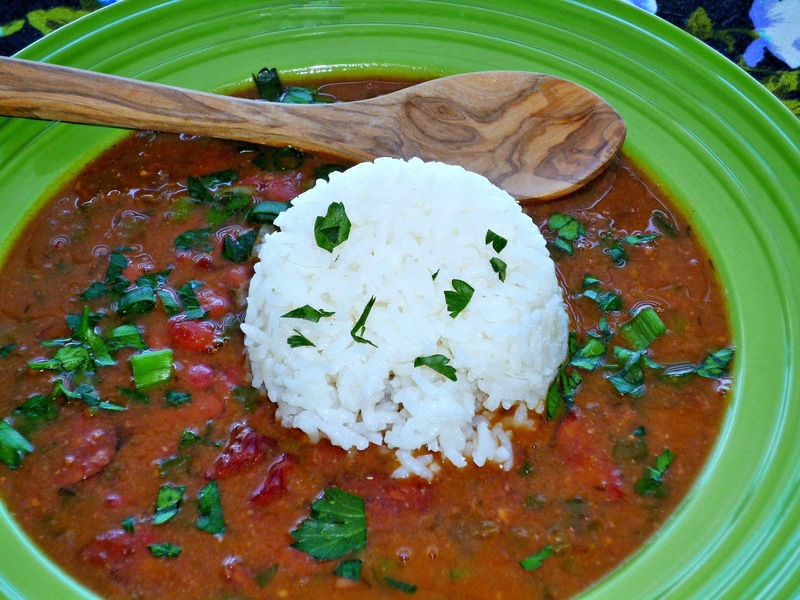 I love the addition of rice to give it the traditional red beans and rice profile that New Orleans is known for. The Gallo Merlot is a fabulous pairing for this soup – its smooth flavors of cherry, plum, and oak work perfectly with the soup’s smoky pork and spicy seasonings. I’m not saying you’ll get engaged if you serve this soup to the object of your affection…but it will definitely bring a happy smile to their face! Be sure to check out all of the other Recipes with Meaning that this week’s #SundaySupper participants are sharing. I absolutely love reading about the emotional connections that food can bring! Be sure to join the #SundaySupper conversation on Twitter today! We tweet throughout the day and share recipes from all over the world. Our weekly chat starts at 7:00 pm ET/6:00 pm CST. Follow the #SundaySupper hashtag, and remember to include it in your tweets to join in the chat. To get more great Sunday Supper Recipes, be sure to visit our website or check out our Pinterest board. Would you like to join the Sunday Supper Movement? It’s easy. You can sign up by clicking here: Sunday Supper Movement. What a wonderful story! I love that he couldn't wait to propose!